Yesterday, the FBI announced preliminary crime statistics for 2012 as reported by local police agencies. After five years of large declines in violence—and a more than two-decade trend toward less violence—the number of violent crimes were up slightly. By itself, this might not be too troubling. But this follows last year’s announcement from the Bureau of Justice Statistics that national survey data showed an even bigger jump in violence—17 percent. (It should be noted that violence is very rare, so while it’s a large increase percentage-wise, in real numbers, the increase was from 3.3 violent victimizations per 1,000 to 4.3 per 1,000. Those numbers are very similar to the FBI data, which shows 3.8 violent victimizations per 1,000). So, what are we to make of this increase? After more than two decades of declines, is violence making a comeback? Does this mean that we’re returning to the 1980s, when rampant violence was consistently listed among the nation’s most important problems? Probably not. If you fit a line into very long-term trends, what you see is that in the last couple of years, violence declined below the expected rate predicted by the trend line. 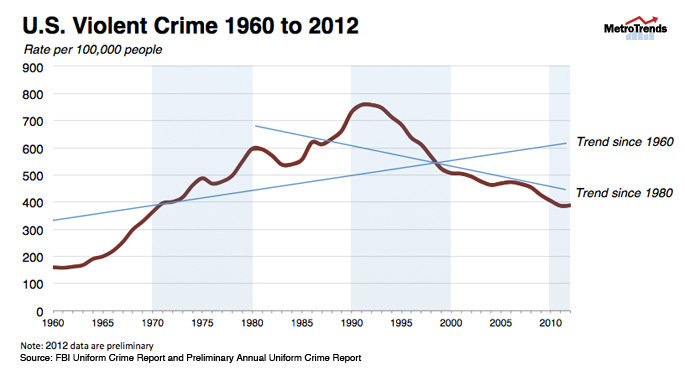 Crime trends, and especially trends in violence, are notoriously hard to predict. Subtle changes in weather, consumer behavior, policing, and numerous other factors can all cause short-term fluctuations around the long-term averages. The key is this: if violent crime continues to increase at the rate that it did from 2011 to 2012, it will still be many years before violent crime rates cross above the long-term downward trend. While 2012 does not appear to have been a particularly good year in our fight to reduce violence, it does not send a strong signal that darker days are coming. Yes, but just wait... If violence increases (even a little) in 2013, the "Chicken Little" law enforcement groups will sound the alarm about a coming storm of violence, just like they did when violence crept up in 2005 and 2006 -- just before it fell again.